At abarbistro we’ve always prided ourselves on good food, good service and great wine. This summer we’ve decided to try and offer a little more over the bar for you wonderful customers. 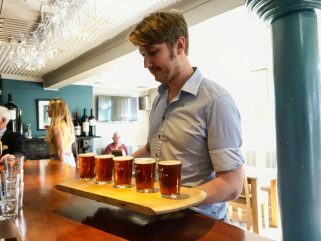 In mid June we doubled our range of ales available on the bar to 4, adding another local ale, Upham Punter, who kindly donated a keg to help launch the extended range and also to treat any visiting dads on Father’s Day. We brought a TV into the bar to show the royal wedding, the FA cup final & world cup. With all those events having finished we decided we would raffle the TV and raised £460 for our two local charities, the volunteer lifeguards and the life house soup kitchen. 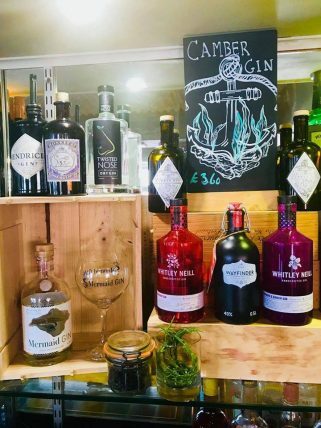 This week we have launched our Gin bar offering an extended range of Gins including our very own Camber Gin, which has coastal botanicals including seaweed, samphire & seabeets as well as pink & black peppercorns. We have also started offering our very first range of Gin Cocktails, designed to enhance the flavours of the individual gins. So there you have it. There is no excuses now, whether you like your food, are a wine buff, love your gin, enjoy cocktails or just a good beer, we have it all! Join us at the abar this summer!